Couple of months ago, we wrote about the process of blogging, as we understood it after about 2½ months of consistent posting. Not sure that understanding has increased, although the consistency has remained. At least in frequency, if not quality. The quality thing can always be improved. Received a modest number of hits in the past four months; averages about 16 per day, day in and out. A couple of times about 90. A bunch of times, a loyal few. Some of the early weeks — totaled 20. Where do those statistics come from, you may wonder? From our weblog host, WordPress.com. What a terrific organization! Hosting at this site is free. Support has been superlative. L-HC was rejected. Why? They reported that L-HC was not interpreted correctly due to a bug (go figure!) in Internet Explorer v6. We never saw it, because we run v7 at the CurmudgeonDungeon (say that 10 times quickly!). At work next day, pulled up the site on the office PC (something we try not to do because we’re not at all sure that freedom of expression in a blogging context exists there) to verify the issue; sure enough, the sidebar contents fell to the very bottom of the lengthy page. A very ugly look. So, I contacted WordPress support. Got a prompt answer: Yes, it’s a bug in IE6, usually caused by graphic elements of excessive width in the main panel. Maximum such width for our theme, Contempt (wonderfully appropriate for a curmudgeon — and one of WordPress’ most popular themes) was stated as 460 pixels. Thus, I needed to go back into the bowels of history to find the offending post(s). A big task, that took some time to get to (this is supposed to be a hobby, right?). Finally, a couple of weeks later got around to rooting around in the past, a job made reasonably easy by WordPress and a member of MUDGE‘s Blogging Process Hall of Fame, Windows Live Writer. Found a couple of potential offending graphics, resized them with an ancient, paid for version of Paint Shop Pro, and all seemed okay in IE6. Reapplied to the promotion site, was accepted this time, and am gradually figuring out what makes that site tick. A 20% increase in 50 days! And yet, got an answer within hours to my query. Last weekend, WordPress was experiencing some kind of problem, because several posts did not land cleanly. 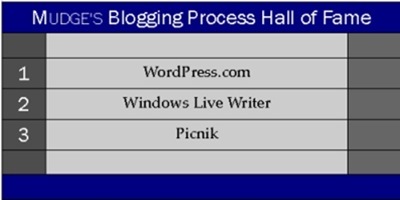 The result, a lack of synchronization between Windows Live Writer and the blog on WordPress. Thought it was me. Sent off a query. Got a response within hours seeking further information. Replied with a clarification of the incident, and received a response to the reply within a very short time, promising some research. Received another response shortly, admitting a WordPress.com server timing issue, since repaired, and all has been well since. The point is not that they had an issue on their side. The point is, with nearly 1.5million sites, they still could respond so promptly, courteously and effectively. 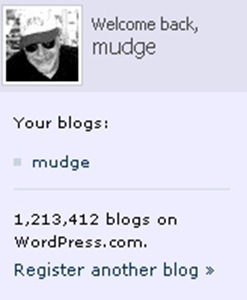 WordPress.com has vaulted to the top of MUDGE‘s list, not to make any less of numbers two and three, used to great effect every post. And, the price for the entire suite is right: $0.00. Can’t beat that! This entry was posted on Monday, September 10th, 2007 at 4:32 pm and is filed under Blogging, Blogging Process Hall of Fame, musings, Technology, The 'Sphere, Writing. You can follow any responses to this entry through the RSS 2.0 feed. You can leave a response, or trackback from your own site. Yes, wordpress rocks! Part of the success of wordpress is that it’s open source. I am a strong believer in open source. Not to mention wordpress has been blocked in Turkey! Them is braggin’ rights. I suggest EVERYONE download Mozzilla Firefox. It is the best browser ever and it’s free and open source. No more nasty ie probs and firefox has a mozillion addons and extensions! Agree 100% about open source. I was an early fan of OpenOffice, and my first version of Firefox was 1.0.